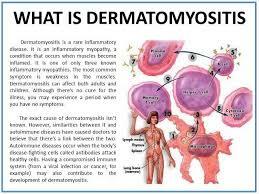 Dermatomyositis and Polymyositis are multisystem autoimmune disorders. They primarily affect the muscles but also can cause skin rashes, lung inflammation and arthritis pain. Muscle weakness is the most common symptom of both diseases. The muscles most typically involved are the deltoids in the shoulders/upper arms and the hip flexors. Weakness of the neck flexors is also common. Distal muscle weakness of the arms and legs tends to be mild, if present at all. The muscle weakness usually develops slowly and gradually worsens over a period of several months. Patients often notice increasing difficulty when climbing stairs, getting up from a chair, carrying heavy groceries or lifting. Sometimes, muscle and/or joint pain and swelling are present as well. However, muscle weakness, rather than pain, typically is the primary problem. As these disorders progress, patients may start to notice muscle atrophy shrinking. Internal organ muscles, such as the muscles of the esophagus and heart, may be affected. In addition to muscular symptoms, Dermatomyositis (not Polymyositis) is associated with several associated characteristic rashes. Gottron’s papules are reddish/purple scaly patches on the knuckles of the fingers. Heliotrope eruption refers to a reddish/purple rash on the eyelids. Other typical rashes include sun-sensitive rashes on the neck and face as well as a scaly rash on the scalp that resembles psoriasis. 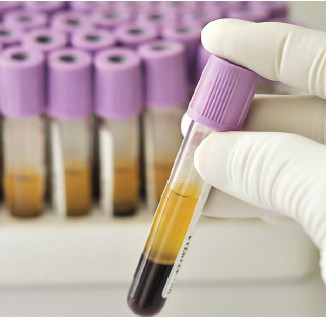 When the blood is tested, Dermatomyositis and Polymyositis usually result in abnormal lab findings, including elevated levels of muscle enzymes, inflammatory markers and autoantibodies. If Myositis is then suspected, an MRI and electromyography will show characteristic abnormalities of inflamed muscles. A muscle biopsy is the gold standard for confirming the diagnosis. 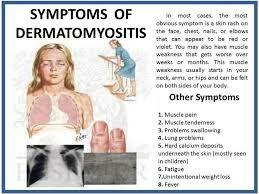 Dermatomyositis and Polymyositis are typically treated with glucocorticoids initially, along with glucocorticoidsparing, immunomodulating medications. These diseases and the medications used to treat them require close, careful monitoring due to concerns about significant potential side effects. At Arthritis and Rheumatism Associates, we have many years of experience in treating these complex diseases and managing appropriate medications. We understand the different monitoring requirements for the diseases’ effects and the medication toxicities.